On Display from November 11, 2010–June 20, 2011 at the Studebaker National Museum. 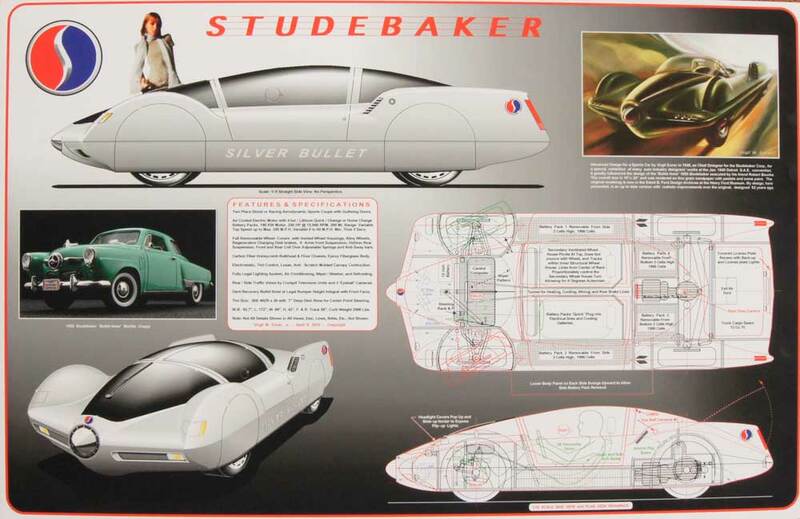 The Studebaker National Museum is featuring an exhibit entitled Designing the New Studebaker: A Project by the League of Retired Automotive Designers. 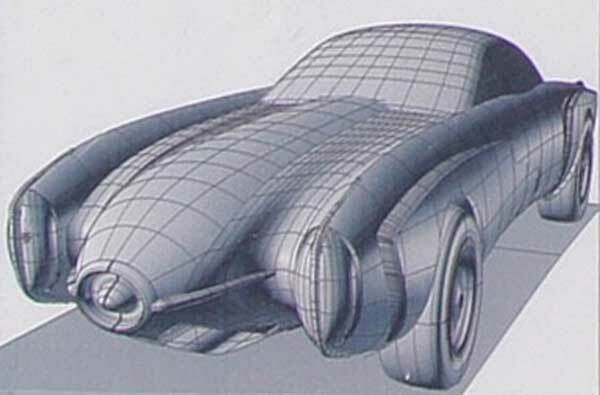 The League is a group of automotive design veterans from Ford, General Motors, Chrysler, AMC, Studebaker, and Packard who are devoted their experience and talent to design a 21st century Studebaker. The designs and artwork were specifically created for this exhibit and have never been seen before. The designers are experienced and have had distinguished careers. The designs were created on an individual basis and not in a studio setting. There is no commercial intent with the exercise. All effort was voluntary, just for the fun of it. No rewards were expected. 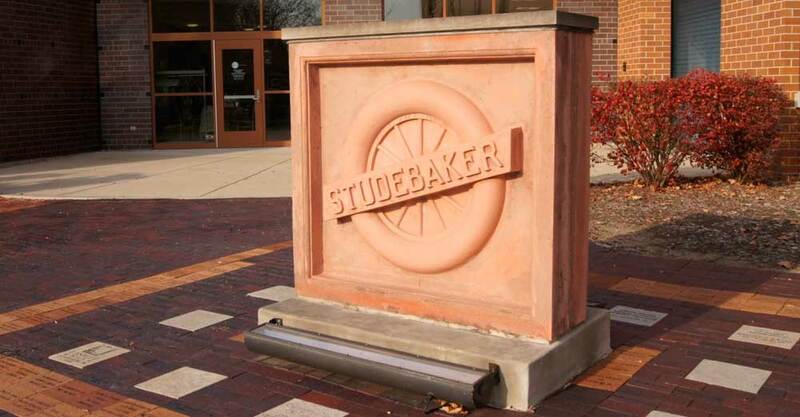 The Studebaker National Museum is located at 201 S. Chapin Street in downtown South Bend, Indiana. It is open Monday-Saturday, 10:00 a.m.-5:00 p.m., and Sunday 12:00 p.m.–5:00 p.m. Admission is $8.00 for adults, $6.50 for seniors over 60, and $5.00 for youth ages 6-18. For more information call the museum at (574) 235-9714, toll free at 888-391-5600, or www.studebakermuseum.org. 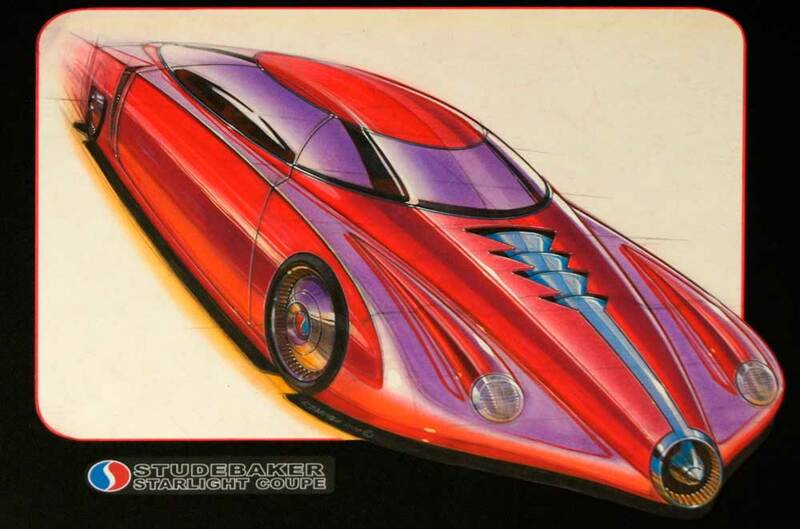 For information about the League of Retired Automotive Designers, contact Ron VanGelderen. 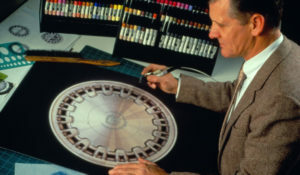 Charles M. Jordan, an accomplished designer for General Motors, Jordan tenure also included overseeing GM’s luxury brands including Oldsmobile, Buick and Cadillac, before being named Vice President of GM design in 1986. 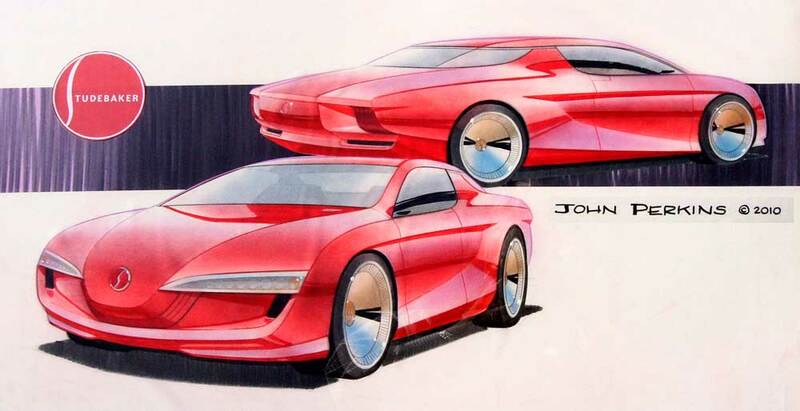 Jordan’s body of design work at GM includes the 1955 Cameo show truck, 1956 Buick Centurion Concept, and the XP-700 “Phantom” Corvette, and the Opel Manta Coupe. Jordan also has contributions to the Buick Reatta, Camaros, Firebirds, Aurora, the Ultralite, and the Sting Ray III. Donald Wood. As chief designer for General Motors, Wood spent 38 years with this company. His most famous contributions are the 1968 Chevrolet Corvette, 1987 Chevy and GMC full-size Pickups, Suburban, Blazer, and Yukon. Joan Klatil Creamer. 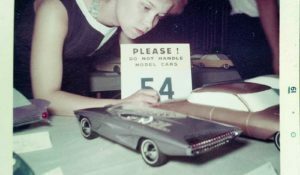 After attending Cleveland Institute of Art, Joan Klatil Creamer became General Motors first female exterior designer. After leaving the auto industry, Creamer designed for General Electric before branching out and starting her own business of product design. Creamer’s impressive designs have varied from making crystal for Lenox to photo frames for Things Remembered. Joseph A. Papai. A native of South Bend, Indiana, Papai received his Bachelors and Masters Degrees from the University of Notre Dame. 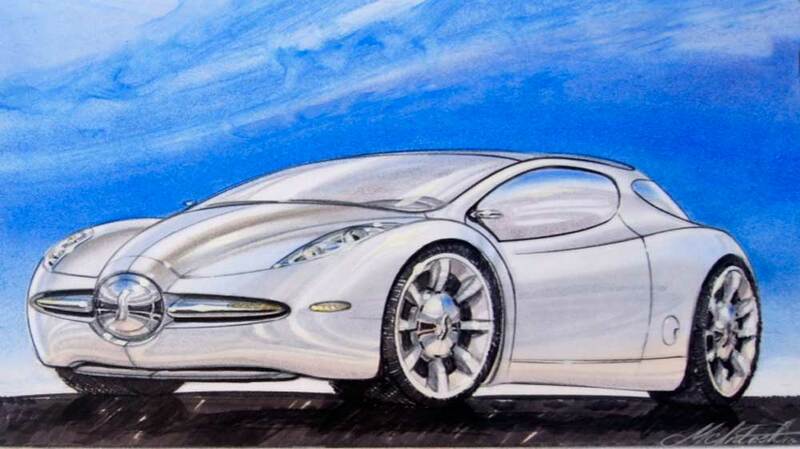 Having experience in various industrial design positions, Papai has worked for Wheel House Products, Ford Motor Company, Coachmen Industries, American Motors, Chrysler, and Daimler Chrysler. Papai taught design as a professor at both the College for Creative Studies in Detroit as well as the Cleveland Institute of Art upon his retirement. John Houlihan. A University of Notre Dame graduate, Houlihan has a wide variety of experience as well. Houlihan has worked for General Motors, Smith Corona Marchant, General Electric, Milton Bradley, Timex, and Bulltoro Watch LLC. Steven D. Pasteiner. Pasteiner was the Assistant Chief Designer for the Buick and Chevy 1 studios from 1966-1989. 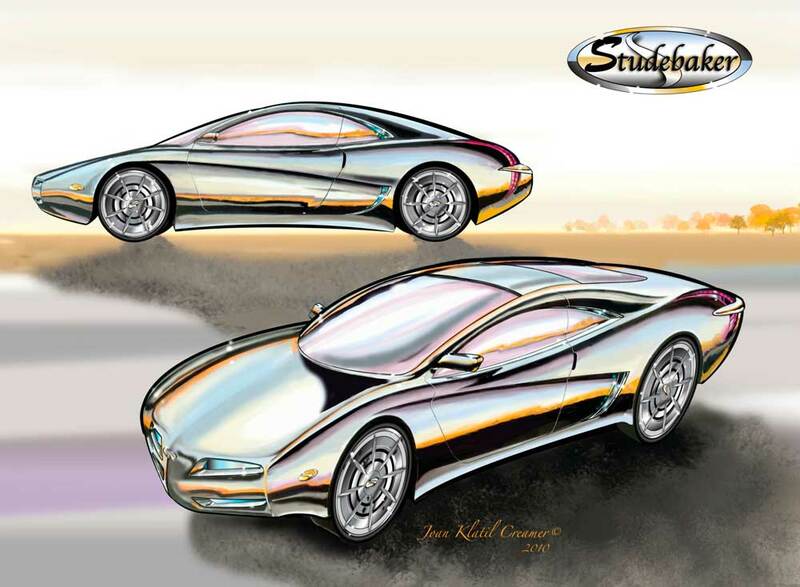 His portfolio includes the Buick Blackhawk, the Buick XP2000, the 1983 Commemorative Edition Corvettes, the ’79 Buick Riviera, and the Buick Grand National. Pasteiner also established Advanced Automobile Technologies in 1989. Virgil M. Exner, Jr. Exner is a University of Notre Dame alumnus and a retired United States Air Force Officer. His vast professional resume includes stints at Studebaker-Packard and the Ford Motor Company. 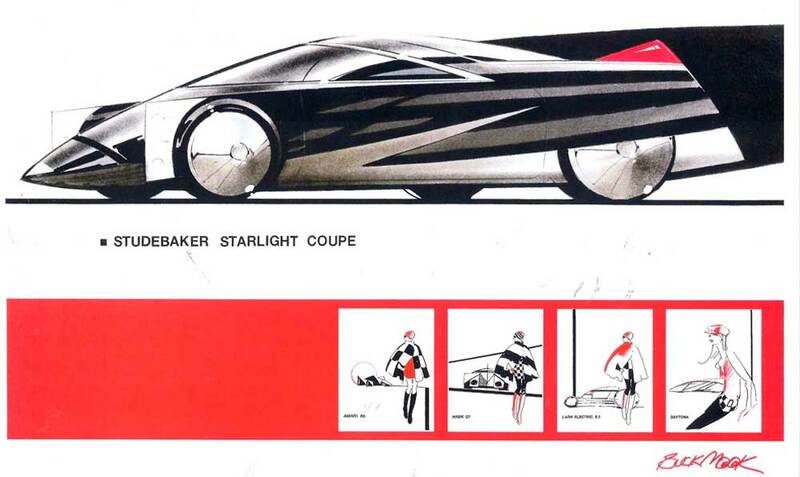 Exner made large contributions to the designs of the Studebaker Lark, Volvo P-1800 S, Fiat 2300 S, Fiat 1500 S, Karmann Ghia 1500, Ford Maverick, Pinto, Thunderbirds, Fiesta, and the Crown Victoria. In addition to contributing a design for the exhibit, Mr. Exner is also serving as the guest curator. Bernie Smith. Bernie graduated from the Central Academy of Commercial Art, Cincinnati, Ohio, in 1950. His career at General Motors spanned from 1950 until 1988. 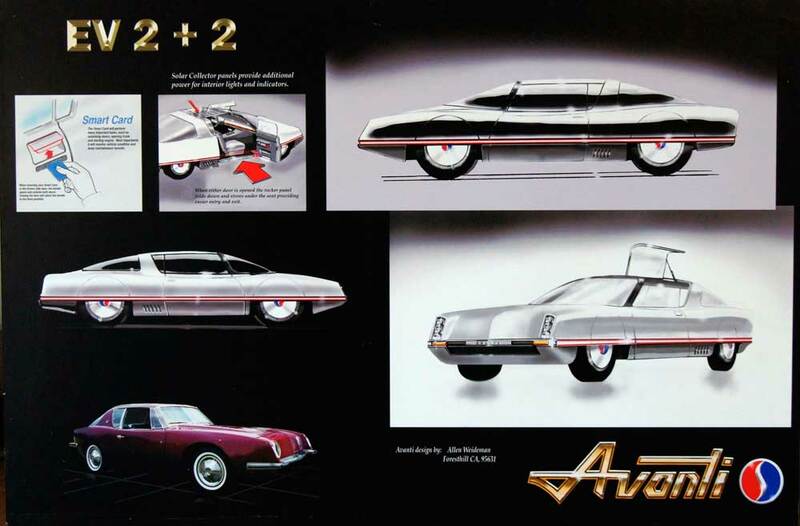 He held many positions at GM, including: Executive Designer in Chevy, Pontiac, Truck, Buick, Oldsmobile and Cadillac Studios; acting Director of Design, Vauxhall; Chief Designer of Advanced 2 Studio, Buick, and Preliminary Design (’65 World’s Fair vehicles). 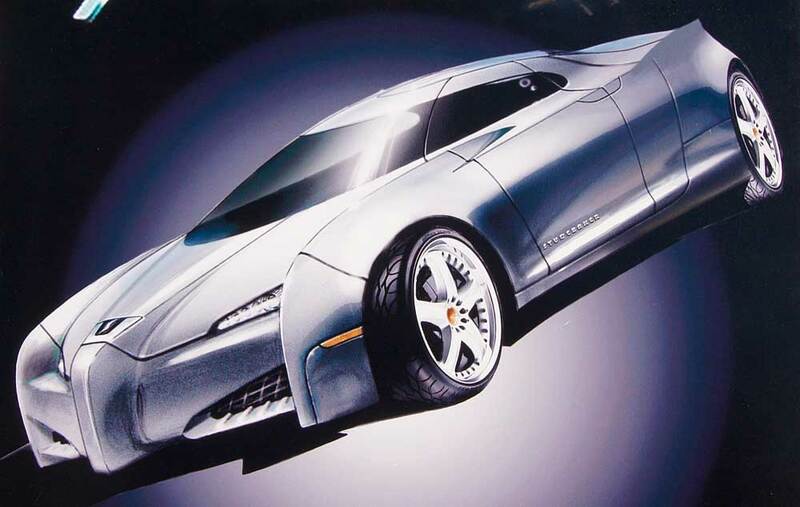 He retired from the position of executive in charge of all GM Advanced Design Studios. Clark Lincoln. 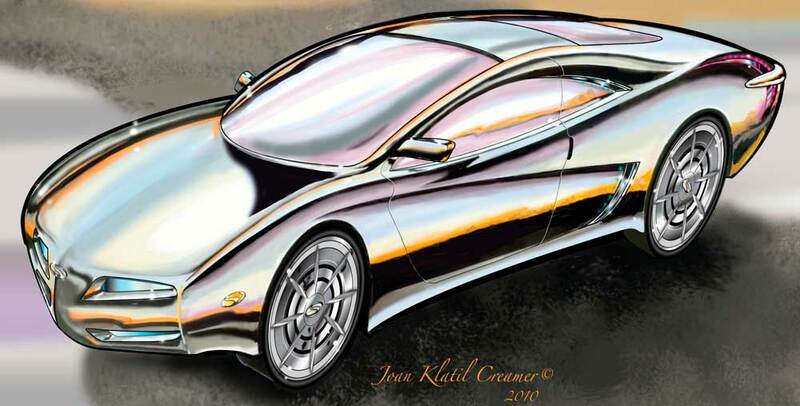 Clark is a graduate of Michigan State with a Master’s Degree in Industrial Design. At General Motors he was Assistant Chief Designer in Pontiac Exterior and involved in passenger car design for several studios. He retired as Chief Designer, GM Truck Studio. Rich Beck. Rich received Third National Senior Award, Fisher Body Craftsman’s Guild in 1964. 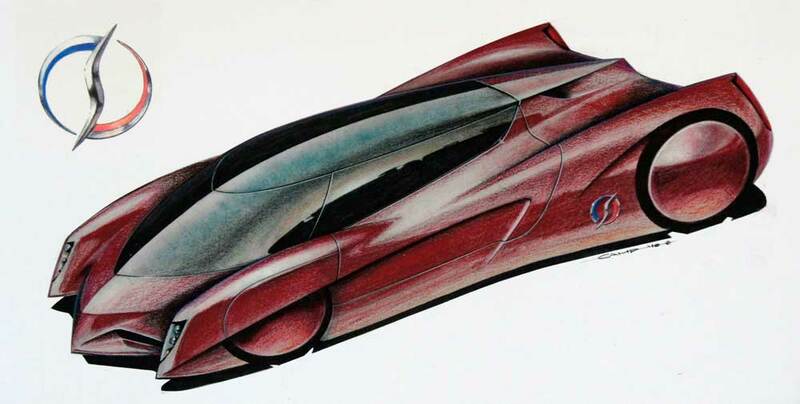 He graduated from Art Center in 1968, and went on to Ford Motor Company, retiring as Studio Designer after 39 years. Richard Wells. Rick is a ’73 CCS graduate. 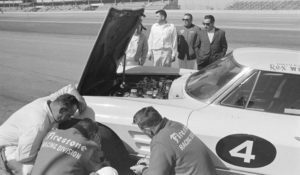 He worked for Massy Ferguson from 1975 to 1978, and then started at Ford Motor Company in 1978, retiring as a Chief Designer in 2007. 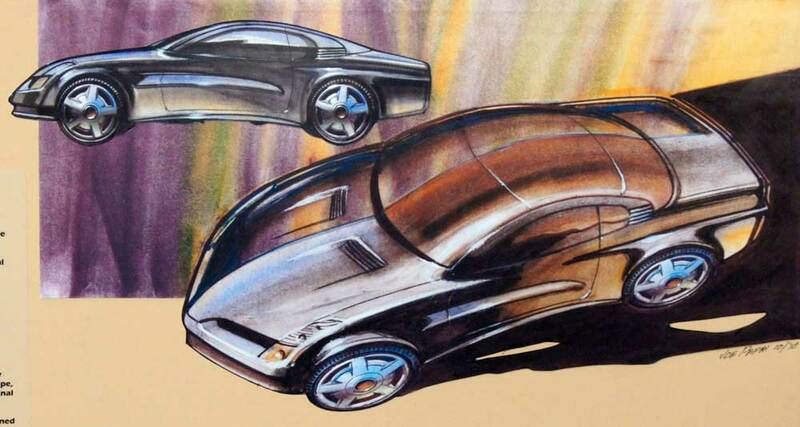 He contributed to the designs of the ’85 T-Bird, ’93 Windstar, ’97 F-150, ’98 F-250 and 350, and the 2004 Fiesta. David McIntosh. 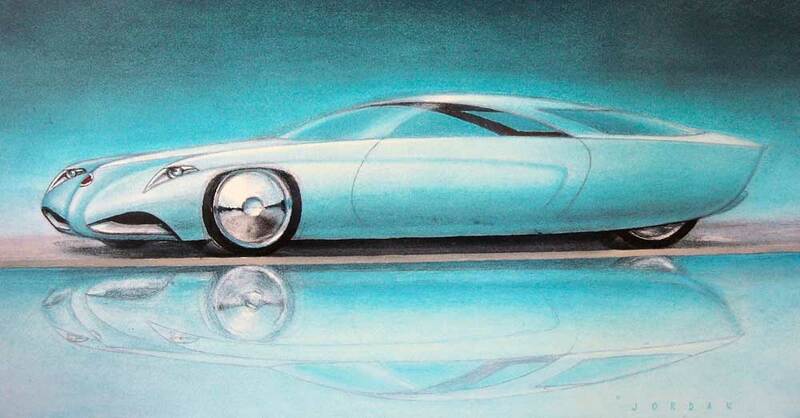 David graduated from Art Center in 1964 and began his career at General Motors Design Staff. He retired in 2003 as an Assistant Chief Designer. Howard “Buck” Mook. Howard is a ’67 Art Center Graduate and began his career at Ford Motor Company in 1967, retiring in 1997 as a Design Executive. 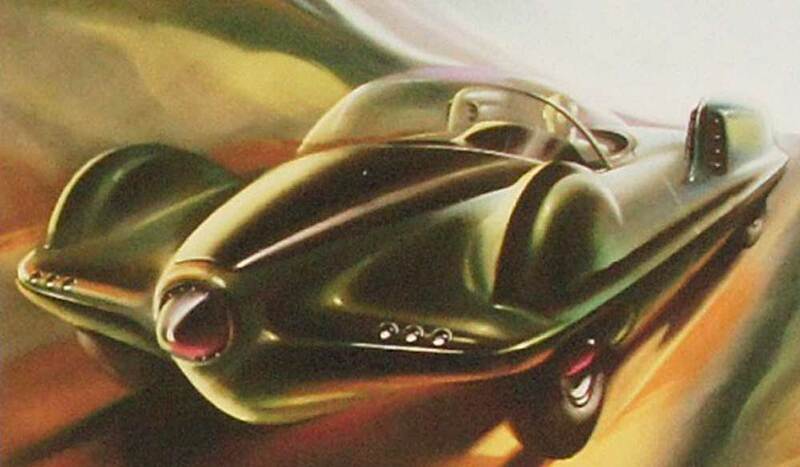 Buck is an avid car collector, artist, and designer. He is currently Vice President of Art & Development, Inc.
Allen Weideman. 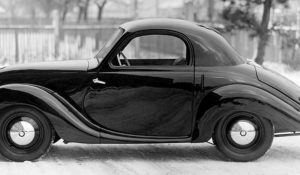 Allen received styling awards from the Fisher Body Craftsman’s Guild five consecutive years, and graduated from Art Center. George Camp. 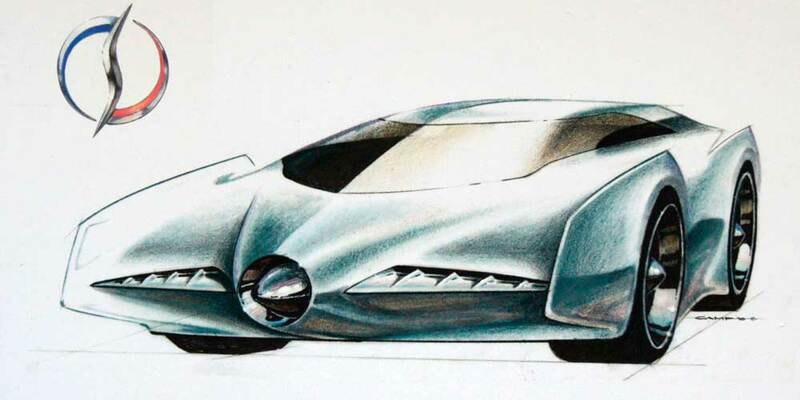 George is a ’63 Art Center Graduate and began his career at General Motors Design Staff in 1963, retiring in 2001 as a Senior Creative Designer. 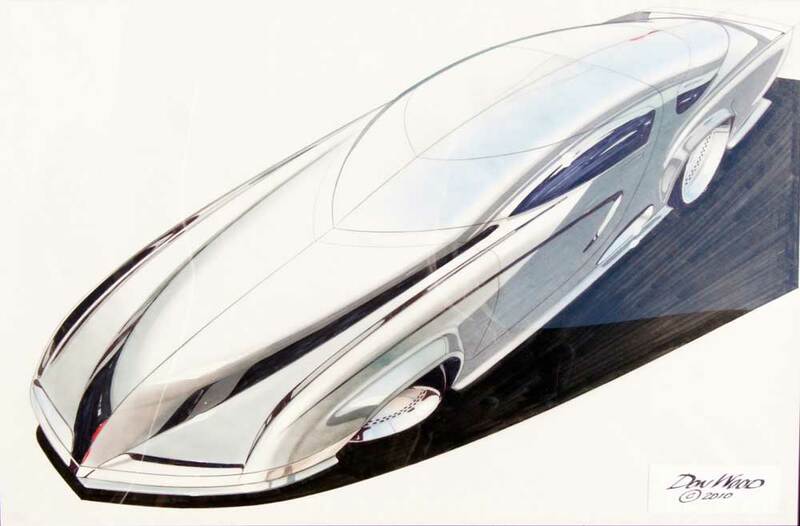 George was a contributing designer for Buick, Cadillac, Corvette, Chevrolet and GMC Trucks, Oldsmobile, Pontiac, Saab, Bertone (Opel), and 15 years in Advanced Design studios. Bill Michalak. Bill graduated from Pratt Institute in 1966, and began his career at General Motors Design Staff. He retired in 2001 as a Senior Creative Designer. Bill contributed to the design of the Olds 442, Toronado, Pontiac Grand Prix, Caprice, Monte Carlo, several Buicks, GM EV-1, Saturn, several GM show cars, the S-10 pickup, and the M-Van. F. J. “Bud” Magaldi. Bud participated in the Fisher Body Craftsman’s Guild in 1965, winning a styling award. He graduated from Art Center in 1966. His career began at Ford Motor Company in 1966 and included assignments in Europe and Brazil. 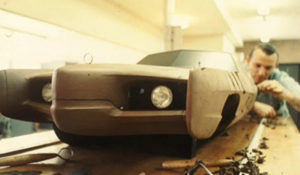 He contributed to the styling of the Taurus, ’83 Thunderbird, Lincoln Town Car, ’94 Mustang, and the Mustang Mach III. 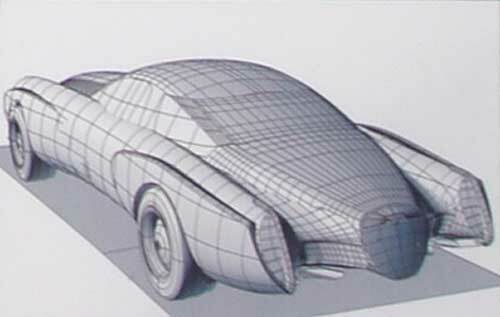 He retired as an Auto Design Executive in 1999. Preston Bruning. Preston graduated from Pratt Institute in 1961. He worked at General Motors Design Staff from 1963 to 2000, and also was an Automotive Design Instructor at CCS from 1980 until 1990. Darwin Hawthorne. Darwin won a Fisher Body Craftsman’s Guild award in 1960, and graduated from Art Center in 1964. He began his career at Ford Motor Company in 1964, retiring as an Auto Design Executive in 2002. John Perkins. John was awarded an Honorable Mention from the Fisher Body Craftsman’s Guild in 1955, graduated from the GM Institute in 1964. His career at General Motors Design Staff began in 1962, retiring in 1999 as a Chief Designer. 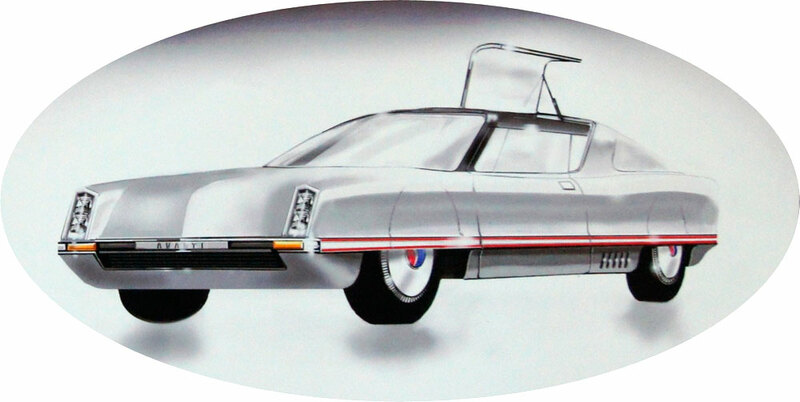 He contributed to the design of the ’66 Toronado and ’67 Eldorado programs. Robert Barnes. 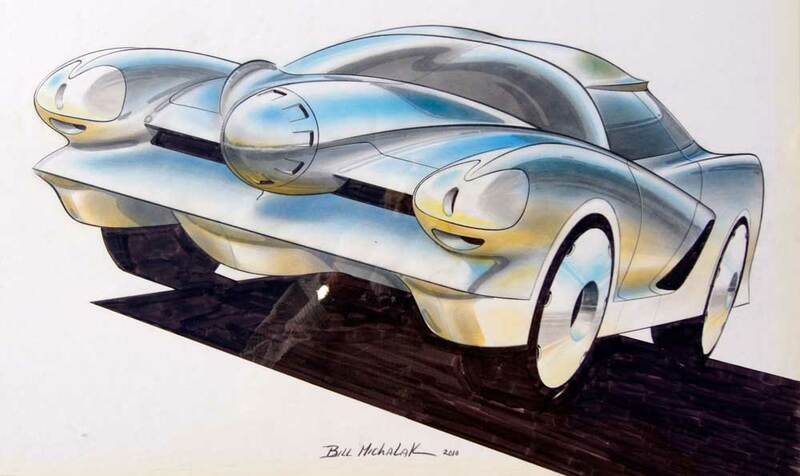 Bob graduated from the Cleveland Institute of Art in 1968, began working for Ford Motor Company, and retired in 2005 as a Design Manager. While at Ford, Bob was acting Chief Designer from 1990–1995 and worked on the all new heavy truck program. had design responsibilities for the 2005–2008 Taurus, Taurus X, and Mustang interiors. He contributed to architectural interiors, advanced programs, concept and production vehicles. Allen WeidemanBill MichalakBob BarnesBud MagaldiCharles M. JordanClark LincolnDarwin HawthorneDavid McIntoshDonald WoodGeorge CampHoward Buck MoorJohn HoulihanJohn PerkinsJoseph A. PapaiPreston BruningSteven D. PasteinerVergil Exner Jr. I love the bullet nose and fins integrated into Buck Mook’s design. This looks like some of the stuff we were doing as young men back in the 60’s for the Fisher Body Craftsman’s Guild. I was inspired by my uncle Jerry Albertson, anyone remember him from the GM Tech Center? also Ed Vershavies, his paddleball partner from Tech Center. I got to drive the Mako Shark around in the lot one Saturday. Uncle Jerry would bring cars home for evaluation for a week or two… he’d take his son, my brother and me, and any kid in the neighborhood who wanted to go to the Highland Park YMCA every Friday night. Sometimes the experimentals would get “borrowed” from out front parking space, ha. Always get them back the next day or so, ha. His favorite and ours, was his 1957 Chevy wagon… ah. This one was tremendous. I’m looking at the designs and talking to myself about what I like and don’t like. Then you ask yourself “why?” The answers reveal as much about our own preferences as anything else. I was amazed at how several of the designs really looked ready for real people…. and how several wre just a bit off-the-wall. 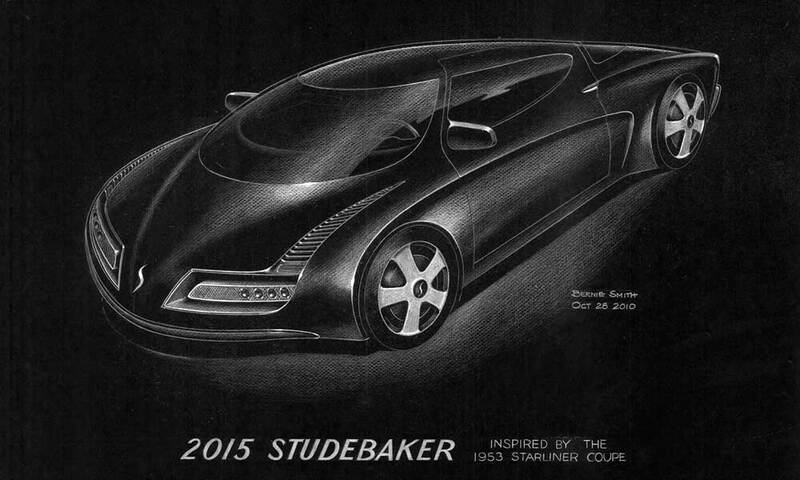 The piece on modern Studebakers is absolutely brilliant. Loved it! Very well done. 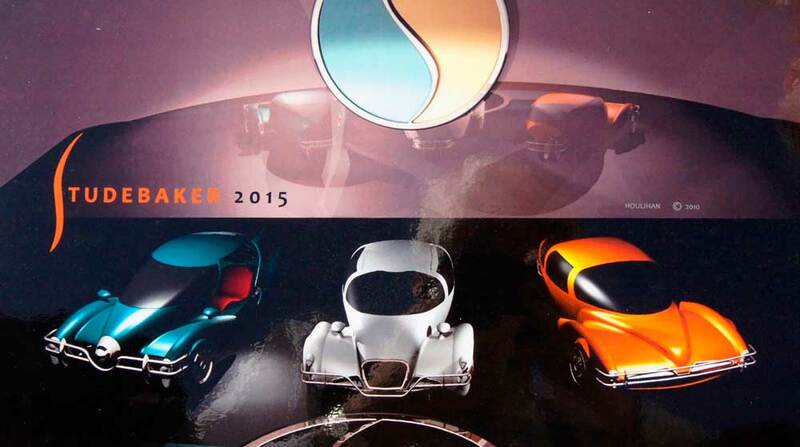 Some interesting designs, though most remind me of recent concepts for other makes. Would love to see artist Steve Stanford, known more in hot rodding circles, take a crack at this! I liked John Perkins renderings the most. He has incorporated the Studebaker styling cues in a tastefull and interesting way, that looks forwards without wallowing in too much of the past. 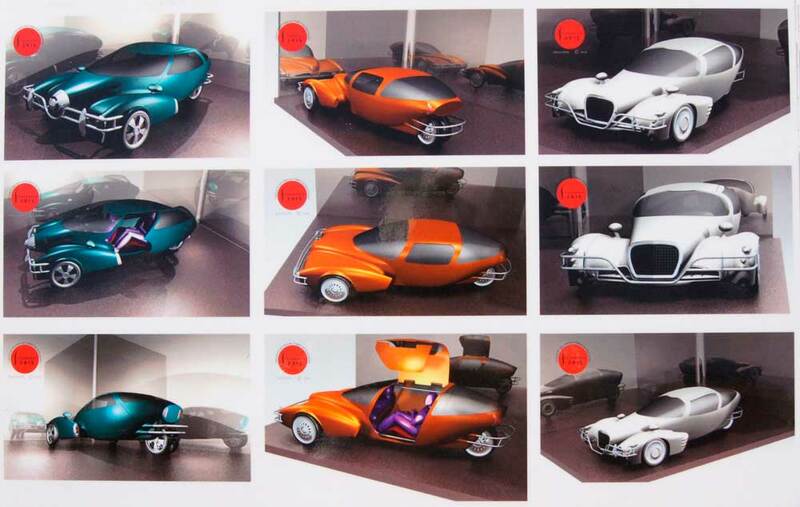 What a treat to see these concepts. Great to see my old friends (Don, Joan, Dave, and George) from the GM glory days. And happy to see that Chuck still has the “silver fox touch”. Very interesting to see the variety of styles, design idioms, and illustration techniques…all different, but all great. When is the next challenge? Excellent presentation by all the gifted designers. 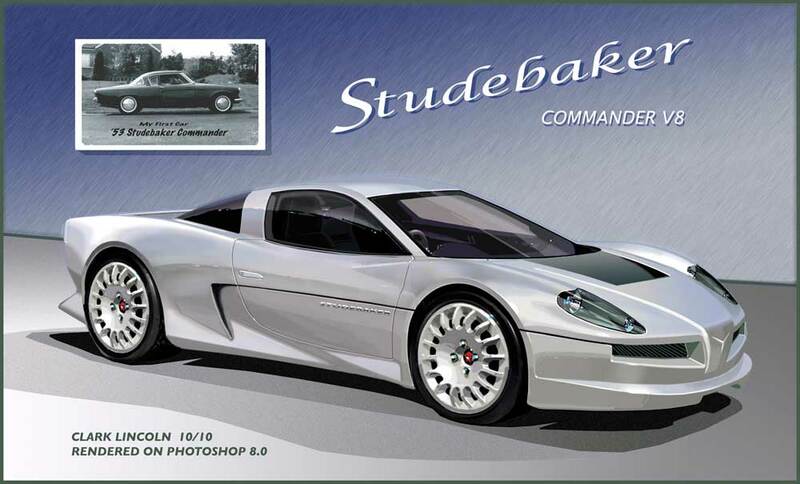 I really wish someone would indeed resurrect the respected Studebaker marque someday soon. 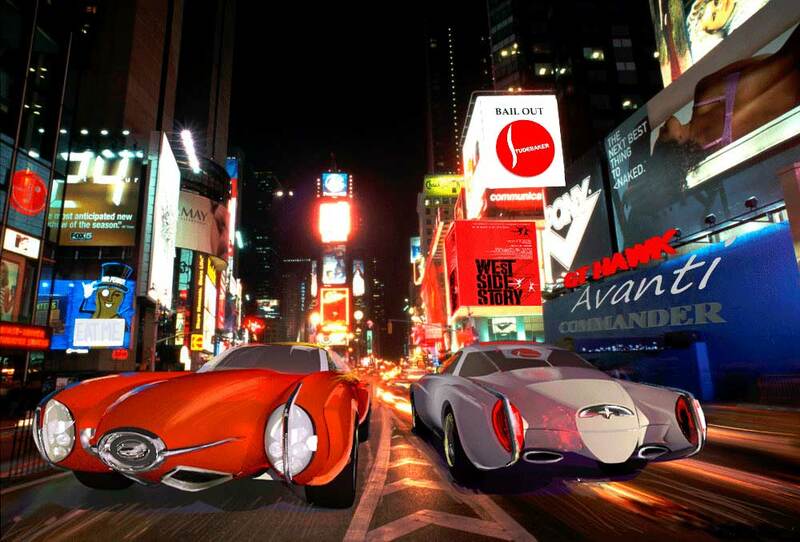 Thank you for sharing the story with us car enthusiasts. 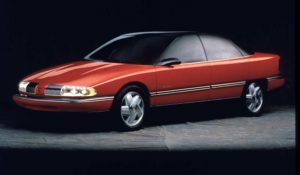 Yes, some interesting designs, but as Dan McGuire mentions, most also remind me of recent concepts for other makes, and others have a decidedly Eighties feel.